Your students will want to meet this famous teenager. Writing regularly increases student reading and writing fluency. Use this Minute to introduce the idea of writing to self. Ask students to brainstorm the reasons people might journal. Share some famous published diaries, such as the diaries of Samuel Pepys or Captain Robert Falcon Scott. Brainstorm different focal points for diaries/journals. Writers might journal ideas or writing seeds. A journal can be a collection of observations or a collection of overheard snips of dialog. Ask students to think about what a writing journal might look like for them, and then, of course, journal about it! While your students most likely have hear of WWII, they may not have more specific knowledge about the Jewish experience. There are thousands of fictional and nonfiction accounts written for children that document aspects at levels suitable for all levels of students. Consider Eve Bunting’s Terrible Things: an Allegory of the Holocaust or Tomi Ungerer’s Otto: the Autobiography of a Teddy Bear. Check with your librarian for assistance to identify the right books for your students. Get out a map of Europe and have students use the scale on the map to figure out the distance from Frankfurt, Germany to Amsterdam, Holland. Now measure from Amsterdam to the Auschwitz concentration camp and again to Bergen-Belsen. Have students look further in Europe to identify which countries were on which side and color code the map. What is typhus? Does it still exist today? Why did so many die of it in concentration camps? How did it spread? Was there any way to prevent it? Send your students to see what they can find out about this disease - the CDC provides straightforward information. Stop the confusion now and educate students about the difference between typhoid and typhus. Have them compare the two and list characteristics that scientists consider when researching a disease. 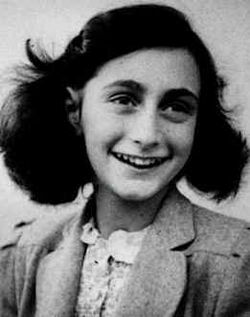 Take your students to visit Anne Frank's hiding spot in the Annex via this 3D virtual field trip that takes the viewer through every inch of the space Anne and her family occupied in secret before German discovery and arrest in 1944. Students are able to move through the space and examine every inch, listening to short descriptions if they choose. As an extension, let students explore the website which includes back stories and answers questions. For teachers who wonder how to handle this sensitive and disturbing period of history, check out the section “For Teachers” that addresses the most common questions students generally ask and the reasons that teaching about the Holocaust is so important. A diary is a prime example of a primary source, so use this opportunity to challenge students to think about the pros and cons of primary and secondary sources. Take a look at the Library of Congress materials on using, citing and finding primary sources.